Chabot is partnering with 1st United Credit Union, a community-based, not-for-profit credit union with a unique fundraising program. 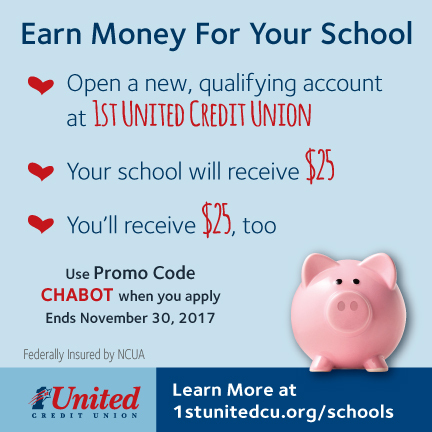 Open a new, qualifying 1st United account by November 30, 2017 and 1st United will donate $25 to Chabot for every new account opened. Plus, they will deposit $25 into a savings account for you or your child, too! They offer youth savings, checking, auto loans, personal loans, home loans/HELOC, credit cards and more. You can visit 1stunitedcu.org/schools to apply for an account – including a youth savers account. Or, stop by their branch located at 6300 College Ave in the new Safeway Shopping center. Enter promo code CHABOT or mention this promotion. Offer expires November 30, 2017.